... Quand la BD swingue! An exhibition presented as part of the Edinburgh Jazz&Blues Festival. Comics and jazz music have more in common than you think. The exhibition ’Bulles Jazz Blues, Quand la BD swingue!’ presents an overview of the presence of jazz in the comics of Brussels and Walloon graphic novel artists. In one comic the hero meets jazz greats like Louis Armstrong or Sonny Rollins. 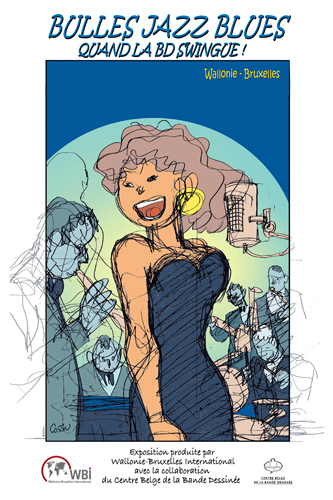 In another comic the atmosphere of a jazz club is the backdrop against which the story unfolds. This is a beautiful exhibition which will whet the appetite of the comic strip fan to want to listen to Stan Getz, Thelonious Monk or other jazz icons, and prompt the jazz listener to enjoy the art of the comic strip. PLEASE NOTE THERE IS NO RECITAL TO COMPLEMENT THE EXHIBITION AS ANNOUNCED IN THE EDINBURGH JAZZ&BLUES FESTIVAL’S BROCHURE – WE APOLOGIZE FOR THE INCONVENIENCE. Exhibition produced by Wallonie-Bruxelles International. Presented in association with The University of Edinburgh - Centre de recherches francophones belges.